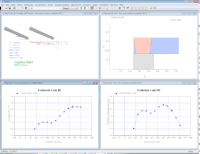 Concepts NREC’s meanline codes design and analyze every type of turbomachine, using a flexible, user-friendly interface with built-in performance mapping. All relevant parameters from the meanline design are seamlessly transferred to our detailed design module, AxCent. 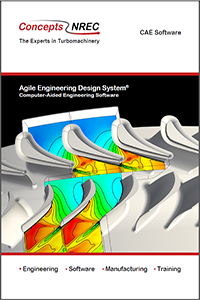 AXIAL supports axial compressors and turbines with design-point and off-design analysis for subsonic and supersonic designs through advanced pressure-based formulation. It covers full analysis of mass flow, pressure ratio, and power parameter and includes estimating hub and tip flow parameters, evaluation of stall and choke conditions, and analysis of multiple choked and stalled components. AXIAL includes a state-of-the-art loss modeling system that incorporates all of the industry standards for this along with the ability for users to modify the standards or define their own models. Setup of an arbitrary sequence of stage elements, such as rotors, stators, ducts, IGV’s, and EGV’s is also well supported. COMPAL is used to design the compressor stage, analyze performance, refine parameters with data reduction, and model the machine according to a number of performance models. Components supported include upstream and downstream elements, radial or axial inlet guide vanes, open or closed impellers, 2D or 3D impellers, and front and rear seals. COMPAL can also be used to design diffusers, including arbitrary vaned, vaneless, wedge/channel, cascade, conical, pipe, and 90/180 degree bends. It can also design exit elements such as collectors, volutes, return channels, and de-swirl and continuous crossovers. FANPAL is used to design the fan stage, analyze performance, and reduce test data to refine input parameters using a variety of qualified performance modeling approaches. It supports design of radial and axial inlet guide vanes, open or closed impellers, and 2D or 3D impellers. In addition to predicting design and off-design performance, FANPAL includes the ability to predict fan noise using the industry standard Mugridge acoustics model. FANPAL can also design diffusers, such as vaned, vaneless, wedge/channel, cascade, conical, 90/180-degree bends, and foil. Exit elements such as collectors, volutes, and return channel can also be designed and analyzed with FANPAL. PUMPAL is used to design, analyze performance, refine the parameters with data reduction, and model the pump according to several industry-standard performance models. Components supported by PUMPAL include inlet guide vanes, open or closed impellers, 2D or 3D impellers, front and rear seals, and various leakage paths. Diffusers, including arbitrary vaned, vaneless, wedge/channel, cascade, conical and 90/180-degree bends are supported as well as exit elements, such as collector, volute, and return channels. 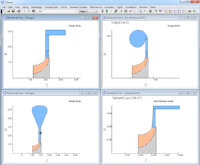 RITAL performs one-dimensional analysis of radial and mixed inflow turbine stage performance using a built-in model for design, analysis, and data reduction modes that supports inlet volutes, rotor and nozzle diffusion/losses, disk friction, and other phenomena of subsonic and supersonic turbine performance.